How to Archive clients you no longer work with and how to restore an archived client if they come back. Managing your clients includes archiving client entries you no longer need and this article will show you exactly how to do that. Tip: We have recently added this feature wherein you can archive a client instead of deleting it. This way, you can easily restore them if you need to. For instructions on how to restore archived clients, please see this article. There are two ways you can archive a client record in Practice Ignition. One is to go straight into the client entry. First, go to Clients which you'll find on the menu on the left side. 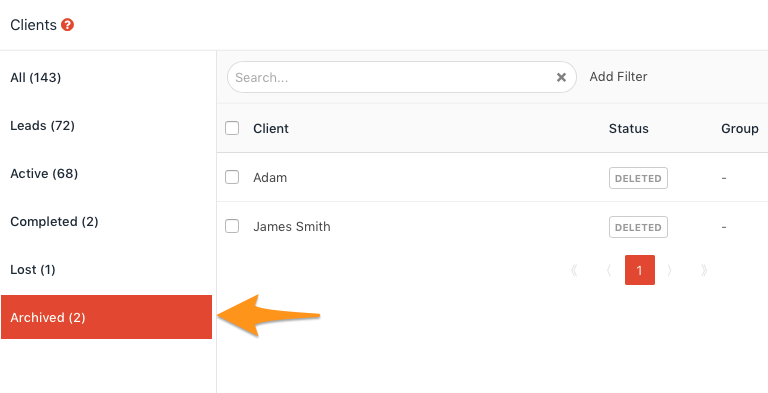 On this page, search for the client you wish to archive in the search bar then hit enter. Go into the client record by clicking on the client's name. Click the Actions button next to the +New Proposal button which will show a drop down menu with the option to archive the client record. Please note, you will only be able to archive a client who does not have any proposals attached to them. If they have a proposal, you can either delete that proposal and archive the client, or alternately, rename the client to something like x-Clientname(archived) to keep the proposal on record but no not to generate any more proposals for that client. This will bring up a pop up box checking if you definitely want to delete the record. Another way to archive a client is directly from the Clients page. Search for the client you wish to delete, and click the tick box next to the record that you want to archive. 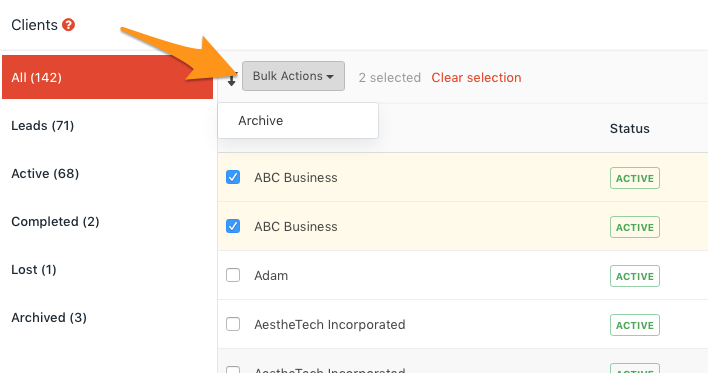 Then click the Bulk Actions button above it and select Archive. You can archive multiple entries through this method. For more information on editing a client, click here. How to restore an archived client? Before, you had to know the Client ID of the record you wanted to restore. Now, we've made it a lot easier! Just go to the Clients page and click on Archived section. It will show you a list of clients that have been archived. Click on the archived client and once you have it up on your screen, click on the Actions button next to +New Proposal button and select Un-Archive. If you have further questions to this article, please feel free to contact us at [email protected].